Have any of you seen the amazing animal story for kids called “Snowman?” Even if you’re not a rider, my bet is you’ll love it. It’s a story of fate and friendship between a man and his horse. Several books and documentaries feature Snowman and Harry DeLeyer. Joseph, Andre, and Haike. Harry spent his life around horses. He and his wife, Johanna, were both born in Holland. During the war, they were part of the resistance, a group that helped Jewish people escape Hitler’s regime. The parents of someone they helped sponsored Mr. and Mrs. DeLeyer to come to America. Harry started his own riding school. Who were his best advertisements? His eight children; Harriett, Anna Marie, Harry Jr., Billy, Martin Joseph, Andre, and Haike. One day Mr. De Leyer went to the auction in New Holland, PA, searching for a good horse for his lesson program. He got a flat tire along the way. When he got to the auction, it was almost over. 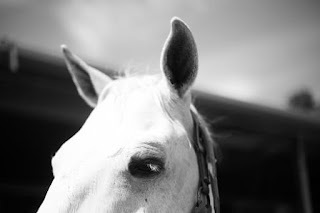 He noticed a big gray horse loaded on the truck, headed for the slaughterhouse. He noticed the kind expression in the big horse’s eye and bought him for $80. Harry noticed markings on Snowman, showing he’d been used as a plow horse. Snowman was wonderful with all riders. He took great care of them and everyone adored him. Things went along smoothly until Harry decided to sell Snowman to one of his friends, about six miles away. A few days later, Snowman trotted into Harry’s yard. Naturally, Harry thought his friend forgot to close the gate. But Harry learned the gate was not the problem. It was closed. Snowman jumped the fence. The two men decided to make the fence higher. Still, Snowman came back to Harry’s yard. Eventually, Harry decided to take Snowman back. Harry’s friend even tied a tire to Snowman, thinking that would keep him inside the fence. But the huge plow horse trotted to Harry’s house, pulling the tire along behind him. Harry trained Snowman to jump. After 3 months of training, Snowman entered a small show. he won the jumper championship. People laughed, believing Snowman’s win was a fluke. So Harry entered a big show the next time at the Ox Ridge Hunt Club. This time, Snowman edged out a famous jumper by one point, to win the championship again. Harry and Snowman were an amazing team. They won championships at Madison Square Garden, and other big shows. Snowman was even elected ‘Horse of the Year ‘ in 1958. In fact, Snowman held a jumping record of seven feet for ten years! Snowman knew Harry was his friend and he’d jump anything he steered him toward. They shared an amazing bond don’t you think? The story of Harry and Snowman is one of my favorites. It’s an inspiring animal story for kids and parents. You can check out the documentary about Snowman and Harry on Netflix. If you’re looking for an unforgettable animal story, check this one out. Snowman is a beautiful animal story for kids and adults. I hope you see the movie or read one of the many books about Snowman’s talents. The post Animal story for kids: Snowman appeared first on deaniehumphrysdunne.wordpress.com.